A night of underground house and electronic music with local talents Giantsiam, Vim, Wasin and An Ant Sunpha. Thursday, Apr 4, 9:30pm. Beam, 1/F, 72 Courtyard, Sukhumvit Soi 55 (Thonglor), 02-392-7750. Free. Silom's underground nightclub celebrates its third birthday with elcectic British DJ Man Power (Geoff Kirkwood), supported by Sunju Hargun and Elaheh. Thursday, Apr 4, 9pm. Safe Room, 2/F, Whiteline, Silom Soi 8, 087-061-1117. Free. Friday, Apr 5, 9pm. De Commune, 1/F, Liberty Plaza, Sukhumvit Soi 55 (Thonglor), 088-419-7380. B300, includes free-flow Singha from 9-11pm. Party all night to classic hip-hop—expect mellow golden-era beats. Friday, Apr 5, 10pm. SoulBar, Silom Soi 8. B200. If you’re bored of techno beats, throw on your dancing shoes and head here for some disco grooves. Friday, Apr 5, 9pm. 12 x 12, 810/22 Thonglor Soi Thararom 2, 094-260-4713. B200. Saturday, Apr 6, 1-9pm The Westin Grande Sukhumvit, 259 Sukhumvit Rd., 02-207-8000. B400. 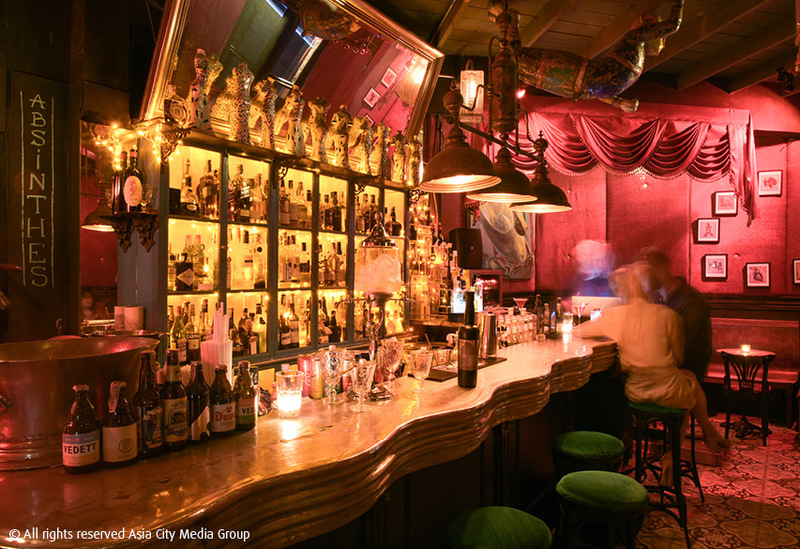 Suan Plu’s most loveable bar celebrates its fifth birthday with special drink promotions from 7-9pm. Saturday, Apr 6, 7pm. Smalls, 186/3 Suan Phlu Soi 1, 095-736-2804. Free. After selling-out gigs across the US, Europe and Asia last year, emerging Thai artist Phum Viphurit is returning to home soil, joined by Thai new wave duo Whal & Dolph. Friday, Apr 5, 8:30pm. Hard Rock Cafe, Rama 1 Rd., 02-658-4090. From B2,500 for six people, includes a bottle of Bacardi Rum or Dewar’s 12 Years. Indie gig organizer Medium Rare kicks off its six-band indie summer series with New Zealand's psycheldelic pop artist Connan Mockasin. Apr 5, 9pm. Noma BKK, 21/66 RCA Block C, 092-264-7957. Early-bird tickets B990/ general B1,290/ combo tickets B2,590 here. A Nirvana tribute party with six local bands. Friday, Apr 5, 7:30pm. The Rock Pub, Phaya Thai Rd., 099-191-5666. B300. A night of eclectic sounds featuring six local bands: Yellow Fang (indie rock); Hariguem Zaboy (nose rock); Little Fox (indie folk); Folk9 (dream pop); Bobkat (trash punk) and Dogwhine (experimental rock). Saturday, Apr 6, 5pm. De Commune, 1/F, Liberty Plaza, Sukhumvit Soi 55 (Thonglor), 088-419-7380. B350. Three of Bangkok’s rising singers and rappers perform freestyle with a live band. Saturday, Apr 6, 7pm. NOMA BKK, 21/66 RCA Rd., 080-939-7899. Free. Live performance by Thai reggae/ska bands, including Isan Jah, Lamai Hansa, Hexthree, Srisawaard, Richman Poorman and The Sweeteyes. Sunday, Apr 7, 6pm Brownstone, 1395 Sukhumvit Soi 77, 085-483-7675. B300. A showcase of prints, paintings, drawings and collage that explore the artist's life and relationships using animals as symbols. Thursday, Apr 4-May 19, 6:30pm. Ardel Gallery of Modern Art, Belle Ville, 99/45 Borommarachonnanee Rd., 02-422-2092. Free. Touring comedy show to hit Bangkok for the Festival Gala, featuring Phil Nichol (CA) and Dana Alexander (CA), among others. Friday, Apr 5, 8pm. Westin Grande Sukhumvit Hotel, 259 Sukhumvit Rd., 02-207-8000. B600 via Ticketflap or B900 on the door. Friday, Apr 5, 4pm. Bangkok Art and Culture Centre (BACC), 939 Rama I Rd., 02-214-6630. B100. Learn how to make uramaki (inside-out rolls), hosomaki (sushi maki rolls) and gari (Japanese pickled ginger). Apr 4 and 7, 10:30am-1:30pm. The Commons, Thonglor Soi 17, 089-152-2677. B2,200 at www.thecommonsbkk.com.